A combination between a puristic form and modern classicism characterizes the Duravit Vero rectangular baths. The Duravit Vero bath is available in six versions (from 170 cm x 70 cm to 190 x 90 cm) and in four forms with one or two sloping backrests. Integrate a well-designed Duravit Vero Design bathtub into your bathroom and combine it with the numerous ceramic products of Duravit Vero series. 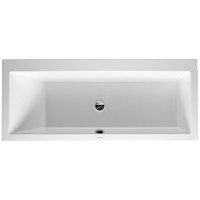 Regardless whether you are looking for a Duravit Vero bath as built-in or back-to-wall version or for Duravit Vero bath supports and Duravit Vero accessories, here you will find the bathtub which suits you well.